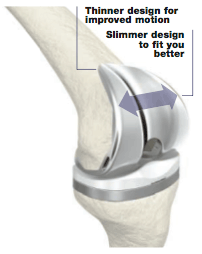 Traditional knee implants are not ideally sized for some women’s anatomy. This may cause the knee to feel bulky and may lead to pain or decreased motion. The Scorpio NRG® incorporates a thinner anterior design, potentially matching the natural female anatomy. With an expanded range of sizing options, your doctor can better tailor the Scorpio NRG® implant to your individual anatomy. With over half a million Scorpio® knees implanted worldwide, you can feel confident with every step.